Every year I fall in love with the holiday decorations at my favorite stores like Target, Anthropologie, and Pier1. A few years ago, I started trying to live with less. After being faced with hard decisions in my personal life, the entire way I look at buying and decor has changed over the last 3 years. As I talk to my friends, it seems more and more of us are embracing a life with less. It's easier to clean when there are fewer things to move around, the things I do buy have more than one purpose and are quality items, you have more cash in your pocket, you invest in intangible things like travel and experiences, and you can live in smaller spaces, if you want to. Tiny house, anyone? Holidays like Christmas are all about abundance and abundant decorating. Extravagant decorating. Really gorgeous decorating! It's been a challenge to get the festive Christmas look I really love and want for my home and still stay on course with my minimalist lifestyle and very purposeful buying. This year I decided to buy very little, if any holiday decor. To date I have spent $50 on Christmas decor this year. 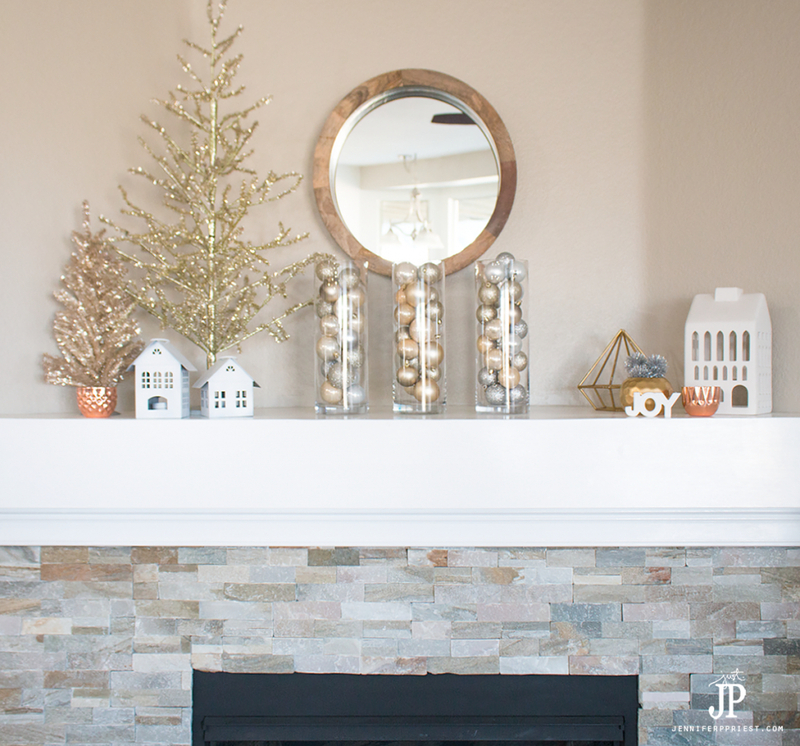 Today I am sharing how I decorated my mantel this year. I kept the mantel really simple this year. Everything looks smaller and less grand in this photo but let me tell, you – this display packs a punch. I'm going to pick it apart, piece by piece to tell you how I made it and why it works so well for the holidays and a life of living with less. First, let's talk color scheme. Metallics are really in this year and so are neutrals. The best thing about metallics is that they can also act as neutrals. Buying decor in neutrals (whites, taupes, greys) and metallics (silver, copper, gold) is smart because these items can compliment almost any other color scheme. 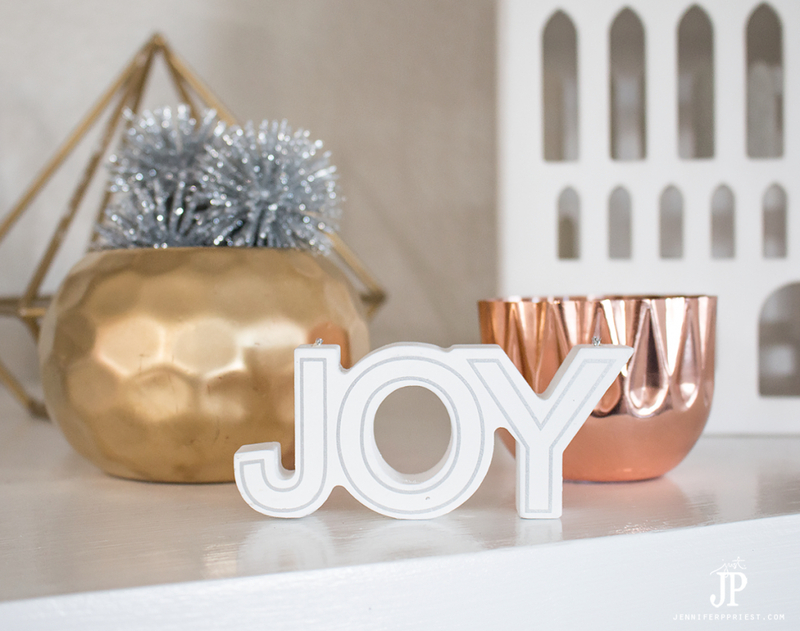 If I decide to go with bright pinks and oranges next year, like in Jennifer Perkins' home, these neutral items I already have will fit right in. When I am shopping, I look for shapes that I like and that will match what I already have in my home. For example, I picked up the large ceramic house on my mantle on clearance at Target over the summer. I then found these metal houses at Pier1 this month, on clearance. But they were black. Keep cans of white and metallic spray paints on hand so you can quickly and easily change the color of items you buy to match your decor. 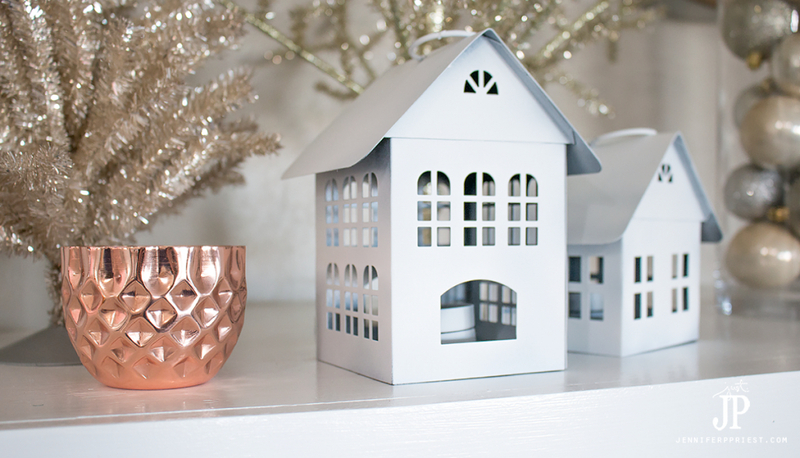 At just $4-6 each, these metal houses were the perfect accessory for the house theme on my mantle and took about 10 minutes to spray paint matte white. One of the trends in holiday decor is to overwhelm your eyes with abundance. More is better, right? One way to make just a few decor items keep the eyes interested is by using combinations of pattern and texture. You don't need A LOT of things to keep the eyes interested but a few well-thought items with texture can really make the space look bountiful and interesting without being cluttered and overwhelming. Find items that are embossed, have texture, or that have a pattern painted on or cut out from them. I got two holiday candles from Anthropologie that were poured in embossed copper cups. These add really pretty interest to the mantel display without much cost. You can find similar containers at the thrift shop and fill them with your own scented wax to make custom candles. These Anthro ones were a splurge at $14 each but I plan to use the containers for succulents and as decor for other holidays once the candles are gone. They contrast well with the window patterns cut out in the metal houses and the fuzzy texture of the tinsel trees placed nearby on the mantel. I also found a honeycomb ceramic vase on clearance at Michael's over the summer. The texture was great but it was a horrible orange color, hence the awesome $1.60 clearance price. A can of gold spray paint fixed this honeycomb vase right up! I bought several of these and have spray painted them different colors as the season change to match my decor. Another way to add interest to a display is by mixing finishes. Mix matte, metallic, and glitter finishes together to create lots of interest to draw the eyes around the display. 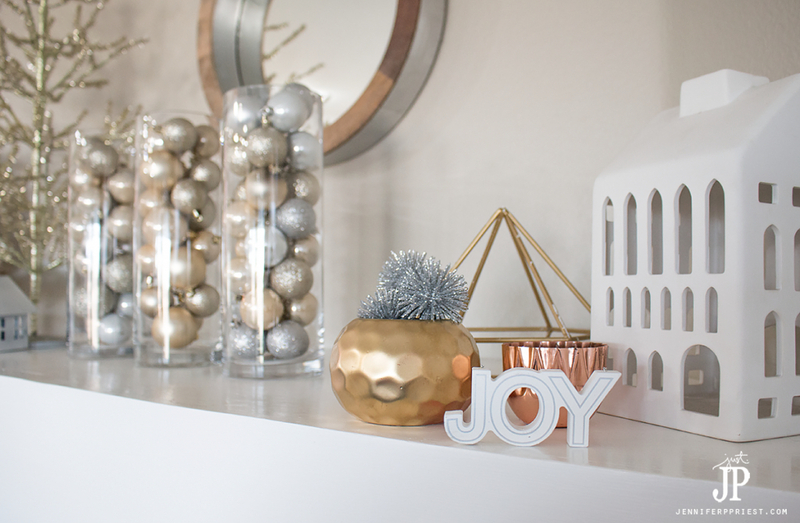 This trio of vases filled with metallic, matte, and glitter ornaments is the perfect trifecta of all the texture and interest in one display. And hey, there's that same white ceramic house I used for Christmas time… see a theme?! Ha! The dollar store is a great place to get fillers in abundance. Later this week, I'll be sharing how we used dollar store items to decorate for a movie night for under $10! Not everything at the dollar store is great. I recommend checking out Dollar Store Crafts to see their ideas for dollar store crafts and joining their DollarStoreCrafts.com Facebook Group to browse hundreds of dollar store and thrifted creations. Have you ever picked up something in the store and wished they made that as something else? When I saw these wooden word ornaments and spiky silver ball ornaments in Target, I thought they'd be great as table top decor. To get the word ornament plus the 3 spiky balls was $6 total at target. When I got home, I cut the string away and voilà: table top decorations! From far away, you can;t even tell that I snipped off the strings from these ornaments. I have a ton of Christmas ornaments so I really don't need more. 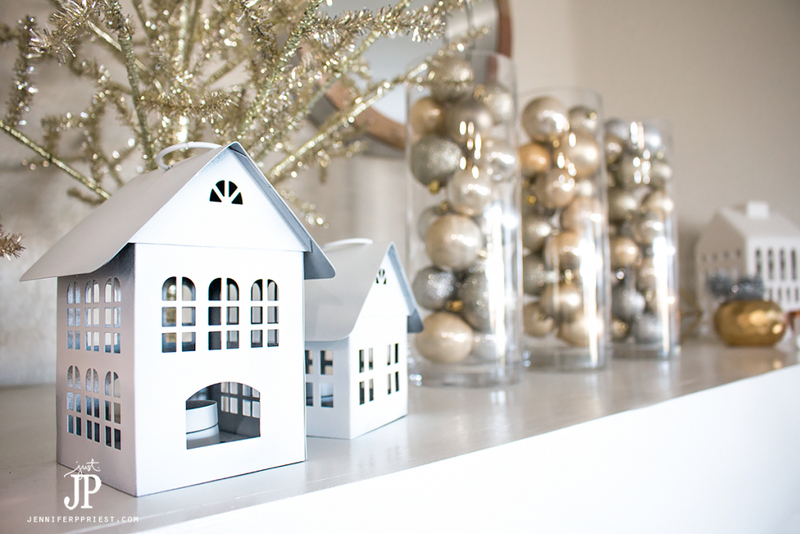 In fact, you can shop your ornament stash for items that can be repurposed into tabletop decor. 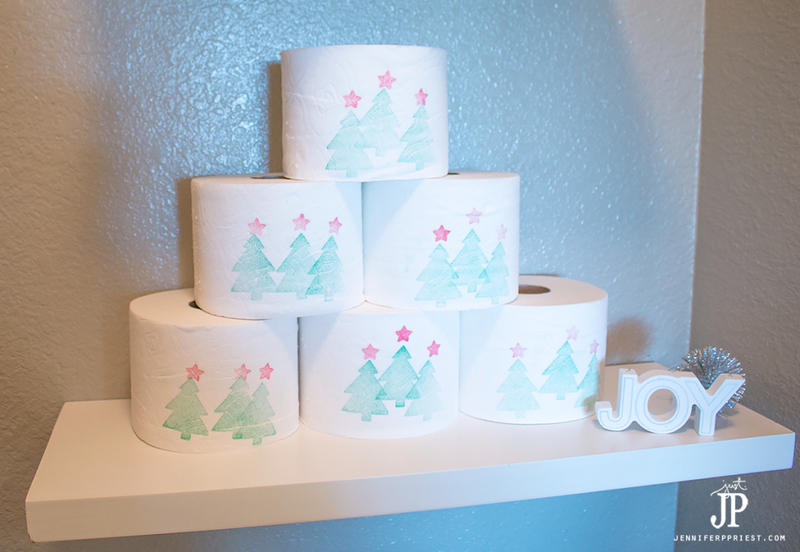 Earlier this month, I used the same ornaments to compliment my (free) toilet paper tree decor in the bathroom! 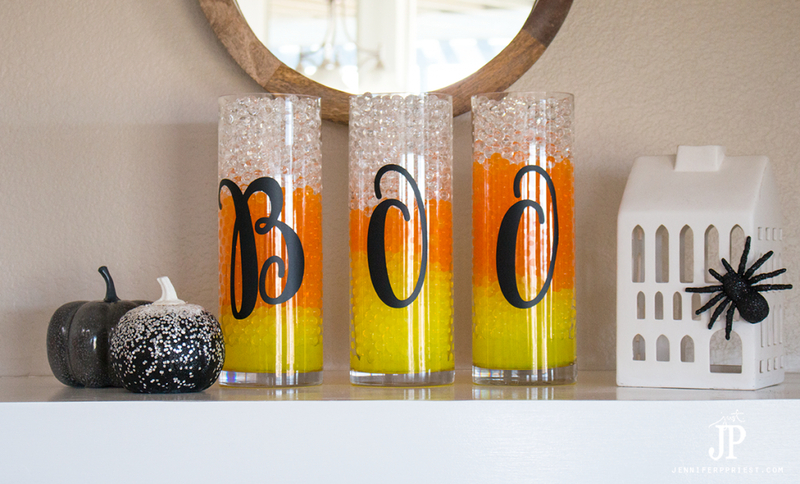 Think about how to repurpose the item in the future – a plain glass vase can be used for many things beyond the holidays! Have tips to share? I'd love to hear them in the comments section! Everything looks beautiful, as usual, Jennifer. You are so talented and I love your creativity. 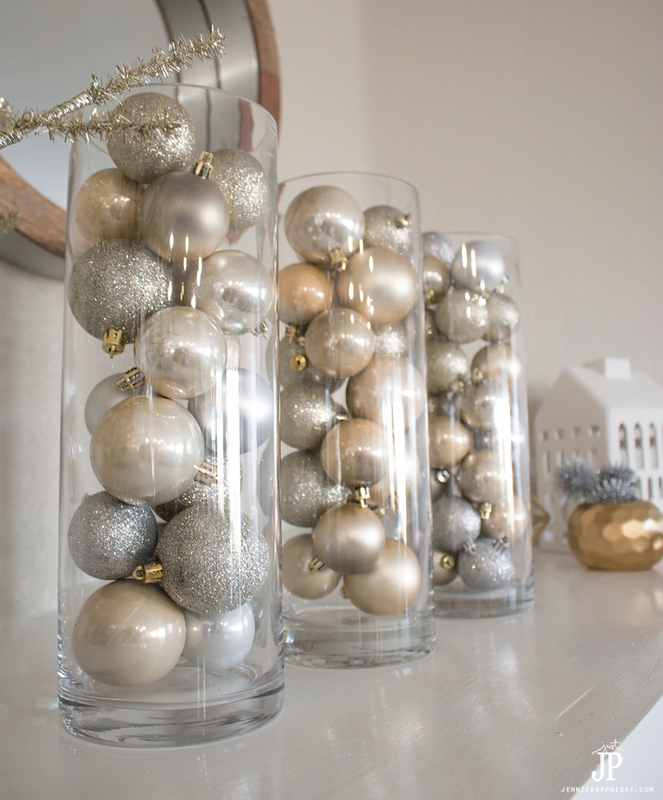 Jennifer, you are sharing amazing tips for a frugal holiday decor! Thrift stores and spray paint have become my best friends since we moved to a tiny house. Love how you filled the trio of vases, I will keep my eyes open for cheap ones on my next visit. Such great ideas! And your mantle is gorgeous. Thanks for sharing at the Wednesday showcase party.